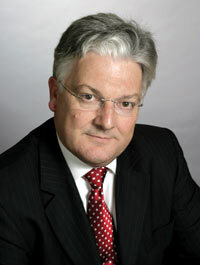 National Library services to schools - are they being run into the ground as closure exercise? In December 2014, while we teachers were flat out with a million end of year tasks and dead on our feet, an email quietly slipped into our inboxes informing us of changes to how National Library would loan books to schools and support learning during 2015. Luckily, NZEI still had some life left in the Wellington office and immediately began co-ordinating a campaign to halt and reverse the changes. Over the next few months, there were protests, letters, tweets, speeches... but alas, the changes did come to pass, if slightly delayed to start in Term 4 2015 instead of Term 2. National Library's logo - via their website. Fast forward to 2016, and in March the rumblings started on the NZ Teachers (Primary) Facebook page that the new National Library Service had failed to meet the standard set by the previous way it was done. Books weren't arriving; when they did there were not enough; the standard of the service had slipped - over a cliff and was half way down, barely conscious and hanging on by its fingertips. Last week I was on the page and someone mentioned how poor the service was this term, and that despite it being week 7, they had yet to receive their National Library books and their inquiry was wrapping up. After a few more comments it was apparent there was a pattern forming. I then initiated a poll on the page, and over four days teachers posted their feedback via the poll and within the comments with their personal experiences. Over 100 teachers said their books arrived too late for the learning they were intended to support and four teachers stated their books did not arrive at all. Many indicated that the new process was too burdensome for one person per school to manage and there was a lack of flexibility. Many teachers felt that they were not receiving enough books per class and that the selection was not great. It was concerning the number of schools that now considered the process was in the too hard basket and were no long willing to utilise National Library to source books for teaching and learning. Many teachers expressed concern that the service is deliberately being run down in an effort to turn teachers off the service, and as participation then falls it can be justified to cut the service completely. As the feedback came in, I began tweeting Peter Dunne (Minister of Internal Affairs, which is where the National Library fits), Education Minister Hekia Parata, and National Library. Mr Dunne was the only one to respond out of these three, and he asked me to stop clogging up his Twitter feed, collate the information and send it to him via email. So below is the summary I have prepared for Mr Dunne. I have included the letter I wrote him, the collated data display, and the raw comments from teachers from last week's post and a post in March about how the National Library service is going on the NZ Teachers (Primary) Facebook page. If, and when, I get a response from Mr Dunne I will hopefully be able to give you positive feedback on what he intends to do to fix the issues teachers have given light to. I am eternally hopeful that Mr Dunne will take this issue seriously - I am a Sagittarian after all. Thank you for the opportunity to present this information from teachers about the performance of National Library services in supplying books to schools and classes to support teaching and learning. National Library has a long tradition of supporting schools, teachers and children in their teaching and learning programmes. Throughout my twenty year teaching career I have had the privilage of utilising the services of National Library in enhancing the learning in my class. It has given me access to books I would otherwise have had no access to. I was extremely concerned, therefore, to receive an email in December 2014 advising that changes to the system would be enacted in 2015. Firstly, the email arrived at an extraordinarily busy time for teachers (end of year reports, updating student records, reporting to senior management/BOTs, prize givings, concerts, trips, room changes, packing up to change schools, etc). Secondly, the changes proposed were alarming. Reading through the stated changes I could immediately see the issues that would arise for rural schools, especially isolated schools, those schools with unreliable internet, those schools with limited devices to take advantage of the online tools the National Library intended to supply. On the following pages you will see a bar chart displaying the results of a poll on the NZ Teachers (Primary) Facebook page that was initiated due to comments on another post about how disappointing using National Library had become. In the following pages, there are raw comments from teachers from the post the poll was in from last week, and from a post in mid March asking for help on how to manage how the books were now arriving from National Library so they could be tracked and not lost. As you will see, teachers were not happy with the service in March and their disappointment is greater in June. Teachers would appreciate that the service is reviewed. Teachers and children are finding their teaching and learning programmes are suffering due to the poor selections arriving, if the books do arrive at all. Many teachers have stated their books have been arriving in the last weeks of the term when the learning is wrapping up, so have not even bothered opening the boxes. 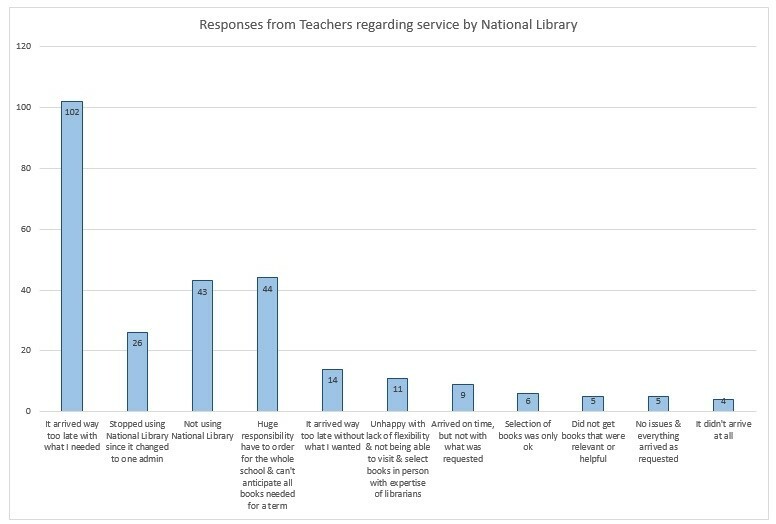 It is the general view among teachers who have spoken directly with National Library staff (usually when asking where the books are) that they are not happy with the new procedures either and staff morale is low in the National Library ranks. Teachers are very worried that the service is being run down in order to close it down. This service is essential for schools to access a wider variety of material than their library can provide, especially for small schools and rural schools. 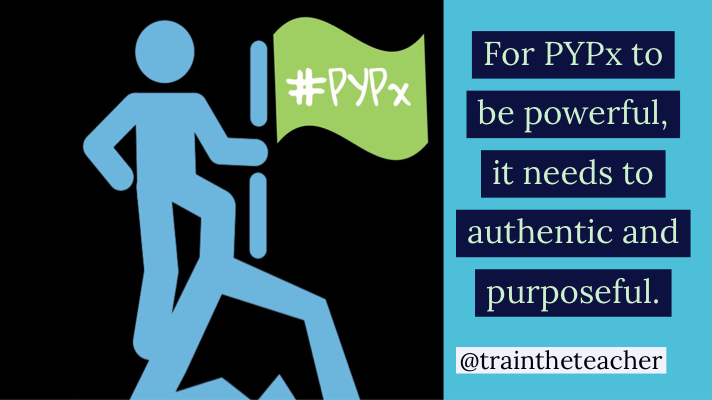 Teachers want to use it, but will not use a sub-standard service that wastes their precious time and does not deliver what is requested. I hope that any review conducted will include all relevant stakeholders, including classroom teachers, school librarians/teachers in charge, National Library and other relevant national representatives. If I can be of any further assistance, please feel free to contact me. The bar chart on the previous page is collated from responses to a poll on the NZ Teacher (Primary) Facebook page. This is a private group for teachers to share resources, suggestions and ask for support from colleagues nationwide and where issues that affect teachers are discussed. This poll began at 11:00pm on Wednesday night and the data was collated at 11:00pm on Sunday night. The poll therefore ran for four days to collect this data. 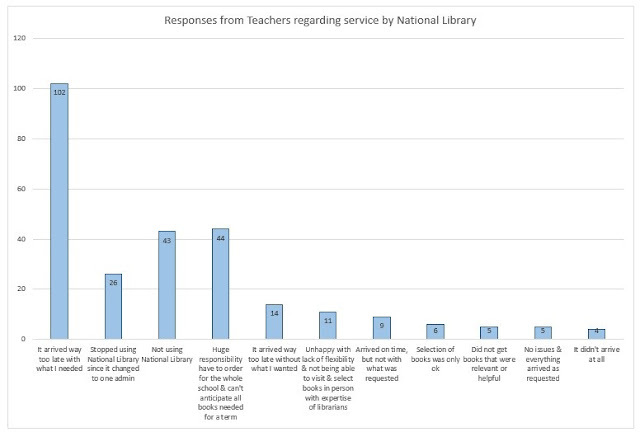 Below are written responses from teachers about their experience using National Library services supplying books to schools since the changes came into action in Term 4 2015. Prior to the changes being enacted, there was widespread protest and letters written about how these changes would impact schools, teaching and learning, and particularly schools in rural areas who are small. What has been very interesting is the impacts on larger schools, as noted in the comments from individual teachers below. I have not included the teacher’s names to preserve their privacy. I used it every term, sometimes twice a term. I don't use it now as it is far too difficult with a few books for 450 students. I risk fines with overdue books on my teacher card at the local community libraries now. I have a choice with my selection, I can order specific books as well. I used to use it all the time with the old system . Don't use it all now because it's too hard. Our entire school (14 classrooms) cannot get any books until next year now because our coordinator sent off an order for one class. Once your school order has gone in that's it. It cannot be reopened. I tried to put in an order yesterday for 4 classes but found out we're too late. Mixed here. So far I have got what my team needs, but it takes a lot of being proactive and keeping in touch with the person in charge of it all to have it work. Huge job for her, and nowhere near as good or easy as it was. What a joke! A library where you cannot go and select your own books. I am the co-ordinator for our school and ordered really early for the last 2 terms. Only got the books into the first few weeks of each term and so they were not used in planning during the holidays because we were not to know what we would eventually get. When the books arrived they were most suitable for the junior school (age relevance) and some teachers changed focus during the holidays and so the books were no longer relevant topic wise. These are still sitting in the box in the staffroom. We are struggling to put together our order for term 3/4 (1/2 the number of books per term) and we are wondering whether it is all worth it... sigh! Hopeless. Book arrived far too late to be useful. First time I've just left them all in the box! What a waste of time for our staff member who coordinated and me filling out all the new criteria. Very unhappy. It's an absolute travesty. My school is 10 mins away, I used to be able to change my books as often as I liked, chat with the wonderfully knowledgeable librarians...And now? 30 books (that's right, THIRTY) for the whole school. It's an outrage. Quite frankly I tried to order books online in January but found that my school had not organised an admin person to take responsibility for our ordering. By the time this was resolved the term was half way through. When we eventually got books there were not enough for all 21 classes as we teach the same concept at the same time. So the small selection we seem to have has not been looked at again. I chose to give up on National Library books at that point and have got a class set from the school library instead. It is a massive job for the teachers who offer to collect and distribute across our school. We received our quota of books for Term 2 in week 3. The system for ordering is crazy - I am grateful to the teachers who have taken it on, on our behalf! I have had no books from national library this year and was a regular user (every term) up until this point. I don't know who the contact is in my school and no one has ever discussed book choices with teachers. I blame my school for this more than I blame the national library though! We have to pick for term 4 now? A bit frustrating. We were sent a skimpy lot of books on the actual topic - less than enough for one class. I haven't even seen them yet. We are still using but books for term 2 didn't arrive until week 4! I'm hoping it will be easier to collect the books this term, now that we have a list of books for each topic. It was a nightmare last term when they were all in one big list. It is also taking teachers awhile to be able to choose the books they want for terms 3 and 4. Sure we know what our overarching topics are, but as for needing anything for term 4 that might crop up in term 3; we just don't know that yet. I liked going in and choosing now just don't get them at all. Takes forever for books to arrive. Don't use it anymore - too hard. Not happy with the new system prefer to choose books to suit my own class. Concerned about not being able to choose my own selection and then returning via post. Too much hassle, so we (as a school) no longer use the service. Haven't used since the changes. Couldn't be bothered with the hassle. Certainly won't bother using it now. It's still a hassle to get books from public library & return them, but at least I know what I'm getting & they're there when I want them!! I don't think any of us will use this again. Way too late and one person doing orders is ridiculous. It was useless. I put in an order and so did another teacher - they sent a puny number relating to the topic and there was nowhere near enough to share. I've ended up leaving them all in her room. At least one person might as well get some use out of them. It's such a waste of time! Now we have been told that even if you want picture books for 5 year olds you are only allowed to order them using an inquiry question!!! So many issues at our school. We ordered books in week 2 of term one for our term one inquiry! They arrived on the Monday of week 11 and weren't really suitable for juniors anyway! Waste of time!!!! Ordering for the whole school hasn't worked. All of us are doing different inquiries. Preferred the old system. What I used to love was choosing books that suited my class and needs. What suits my class does not suit the whole school!!!! Very frustrating. Orders arrive about 2 months after ordering, way too late, and term 3 and 4 orders now is ridiculous. Staff I spoke to there hate it too. We are thinking of ditching it too. Pity, because it used to be a great service! Still waiting for our books for this term haha. Useless now, I like choosing my own books. They arrive late, they don't suit my learners, I hate the New system. I think we've all emailed and written and reposted to stop this and it's all still motored along. I think we can all see that they'll be closing the national library and giving schools the books. what about rural schools without other access points? I like to go in and pick my own books in the holidays. What a treat to spend a day in the library!!! Can't do that now. that was the best. I would take my 5 year old with me. she'd find a corner and just immerse herself in literature. what need is there for validation if we've got kids hungry for books. let's feed them. The Government did cut the service severely probably a couple of years ago now. Doing what this lot do; take a working, useful, functional tool and kill it. They don't want it to work. They want to get rid of it. So what one does if one's aim is to achieve this loftily negative aim is to eviscerate said organisation, demoralise the staff, await the complaints and then shut it down completely because it wasn't functioning at all well. They achieve their nefarious aims whilst being able to say that they are responding to the people. Advanced Bastardry in action. Our school does not use the National Library any longer. We don't have the staff to dedicate to organising the resource. So thank god for Auckland Libraries because I'm now going there and borrowing books for my class. We are a decile 2 school and either I'm borrowing the books or we are going without. Ordering books on a topic can be costly as you pay $2 per book if you miss pick up... nevermind fees if you lose a book. It looks like someone somewhere is looking to do away with the service... It gives the powers that be a genuine reason for stopping the service if we boycott. There was nothing wrong with popping in for an afternoon during the 'holidays' for a read and the odd chat with colleagues. A real shame! They want it to not work so they have an excuse to shut it down. Given it away as a dead duck - just pointless trying to access. Is it true (we got an email from our Librarian) that we have to order term 3 AND 4 now?? or is that just us trying to get something in time? Was a great resource which is no longer. Such a shame. Totally dissatisfied. Arrived last term in week 8, and not here yet for this term. Sent them straight back last term in original box and will do the same this term. What is going on? This was once a great service and resource. The following comments are from a thread on NZ Teachers in mid March 2016. Why did the government change this fantastic service ... Such a valuable resource for teachers and children!!!! Unbelievably shortsighted .... What a schamozzel!!!!! I feel so sad that I cannot go on and choose my own class books anymore. This new system is ridiculous. Keen to hear how others track. Shame book list sent out isn't listed in groupings as in the request, instead of the WHOLE school listed alphabetically. Would be much easier to give each class the list matching their request. it's just made it logistically harder for co-oridantors to manage - the old system was way better. and we can't go in there to browse and borrow; just browse, pure torture if one then has to go online and order it once a term as part of specific title loan. We are using local libraries now. Nat library has dropped the ball IMHO... And so many of us end up paying the overdue fines!!!!! I'm not going to order them. Painful. Will think about it for another time. We literally got about 6 books each this term. Useless. We didn't get term 1s allocation at all! Trying again for term 2 before we ditch. We got books but others got them first, so a waste of time really! Note that you have to order Term 3 AND 4 books at the start of Term 3. You only get your allocated amount, but they must cover both terms. What a joke - a library where you cannot browse and take books out!